Please consider attending this workshop about hydro relicensing. This issue is critical to the quality of the overall recreation experience on the the Lower Saluda for years to come. The information will also be valuable for other relicensings that are going to take place. Please let anyone you know that may be interested about this workshop. Kids Enjoying the Lower Saluda at Columbia. We need all of your help to preserve this. ************************************ You are invited to participate in the Saluda(LakeMurray) Dam Relicensing Workshop sponsored by the South Carolina Coastal Conservation League and AmericanRivers. WHY: A five-year relicensing process will begin this summer for the Saluda Dam, which creates Lake Murray and controls virtually all water flowing into the Lower Saluda River. The new license issued by the Federal Energy Regulatory Commission. (FERC) will determine how the dam will operate for the next 30 to 50 years. KEY ISSUES: How much water will be released into the Saluda and Congaree Rivers to enhance fish and wildlife habitat, Congaree River floodplains, and outdoor recreation? Will water quality of dam releases be improved to meet oxygen requirements of aquatic resources? How can Lake Murray water levels be best managed to meet all public benefits? What is the future of 180 miles of undeveloped LakeMurray shoreline? Space is limited, so please send RSVPs by April 15 via email to scrivers@bellsouth.net or to the address below. 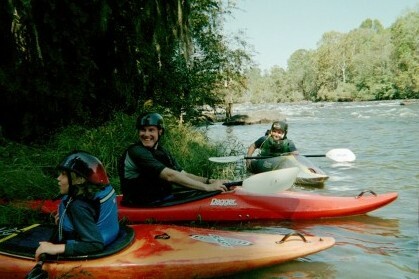 Return to Palmetto Paddlers Main Page.